Search Engine Optimization 101: Why does it matter? After implementing a customized, well-researched, and properly-executed search engine optimization services, your business will see a massive influx of new leads. As one of the world's top search engine optimization companies, WebFX has the expertise, dedication, and proven track record of excellence to ensure your online search engine optimization services are successful and profitable. We have a plan that's perfect for you. We'll pay attention to the keywords that your competitors are using too, in an in-depth competitor analysis. You'll also receive a keyword mapping report and advanced rank tracking. At this part of the process, we will promote your content so that it is seen by as many users as possible, and we'll gain relevant mentions from popular blogs and press sites. Our goal is to create a viral marketing campaign for you and your business. To tie everything together, we'll make sure that your website is driving visitors through your conversion funnel by testing all of the elements that we've implemented. We'll make sure that your calls-to-action are doing their job, and if they aren't we'll fix it. We also believe in continuing to improve your website, so we'll always be there to improve your website in order to get the highest possible ROI for your business. "Search engine optimization may be just one part of an online Internet marketing strategy, but it is the fundamental part. It's the baseline. If you are doing nothing else, search engine placement and keyword-related advertising can make up 80 to 90 percent of your traffic." Our digital strategists have put together successful Internet marketing campaigns for businesses ranging from local coffee shops to publicly traded companies. They'll do the same for you. Request a free quote and experience why WebFX is rated as the world's best SEO agency. Does my business need SEO services to succeed? Many people wonder if SEO services are truly necessary for their business to succeed. The answer? If you want your business to grow and thrive, SEO services are an efficient way to do so. Consider the importance of a page-one search engine result. Most people don't even click to page two when using a search engine, and the most clicks occur within the first few results. This makes it crucial for your business to rank in the top few spots, or at the very least, on the first page of search engine results. If not, it's unlikely that shoppers will even catch a glimpse of what you have to offer. Imagine owning a lemonade stand at the end of a marathon. You're surrounded by many other lemonade stands, and they're all situated at the finish line, while you're situated two blocks back. Before tired runners can get to you, they've already got their lemonade from a stand closer to the finish line. The same thing applies to search engine results. If you're not on the first page, near the top, you'll miss out on extremely valuable traffic. Many businesses wonder if they can simply implement an SEO campaign for their own business, on their own time. In short, your SEO services are best handled by a professional. Though you could absolutely perform SEO for your own website, there are many elements that are best handled by an SEO service agency. Before opting to handle SEO services on your own, as yourself these important questions. Do you have the tools necessary? For example, SEO service providers own thousands and thousands of dollars worth of analytics tools, content tools, and more to ensure that SEO campaigns are successful. Expensive tools can be crucial to a successful campaign because they provide insight and direction that are otherwise unknown. Does your team have the manpower? One of the most important things about SEO is that it's not a "set it and forget it" strategy. In order for SEO to drive results, you have to continuously care for your campaign. It's like a plant that needs water — in order to grow, you have to continue to feed it. Do you have the manpower on your team to dedicate to constant maintenance of your SEO campaign? If not, it's best to hire a professional for best results. Does anyone on your team know the ins and outs of SEO? Though SEO can be easy to understand, it takes a lot of marketing know-how to actually implement a campaign. Is anyone on your team equipped with that knowledge? Whoever is running your SEO campaign will have to understand how to do keyword research, write beneficial and informative content based on those keywords, create actionable headings, drive links, and so much more. With so many SEO agencies out there, it can be a hard make the decision of what agency is best for your business. Should you choose a company that is local, or choose one across the globe? Should you choose one within your budget, or pay extra for additional services? Check out our 5 tips to help you determine what SEO agency is best for your business. Oftentimes, it can be easy to make a snap decision when you're in a hurry. However, finding an SEO agency is something that shouldn't be rushed — choosing the wrong one can cost your business dearly. You should always spend ample time doing research on many different SEO companies. This allows you to read up on the services that each offers, the price range they offer their services for, the culture of the agency, the location, and more. You should be sure to do as much research as you feel necessary until you find an SEO company that provides everything you're looking for, and for a price that fits your budget. The best SEO companies will have hundreds of testimonials, and each one is valuable. Testimonials are bits of praise that past clients offer an SEO company based on the work they've done for them. They're important because they're completely voluntary, and come straight from a client. Taking notice of how many testimonials an SEO agency has can be a huge determining factor in whether or not you choose them to work for your business. Whether you're reading about them on a third-party review site, or reading reviews straight from Google, reading what other people have to say about an SEO agency can be key. Reviews are different from testimonials because they aren't always going to be positive. Reviews offer clients a chance to write about their experience with an SEO agency whether it was positive or negative, whereas testimonials are always positive. If an SEO agency that you're considering has tons of bad reviews, and they outweigh the positive comments, you're better off finding another agency. After all, hearing straight from past clients is as real as it gets! As a business owner, you know the importance of a budget. Without one, you can find yourself in financial trouble — so when you're looking to take on a big initiative like SEO, it's even more important to set a budget and stick to it. The cost of SEO ranges from agency to agency, so before choosing, you should determine your company's personal budget. Once you're comfortable with a figure, set that number in stone, and don't deviate from it. It's important to do your research before setting your budget, though, to ensure that the number you set is reasonable, and can get you the services you're most interested in. In our extremely technological world, it's extremely easy to communicate without ever picking up the telephone. You can chat via messenger or email, but one of the most valuable ways to get to know a potential business partner is by talking to them on the phone. Phone calls allow you to get to know some of the representatives at the company, determine their attitude and personality, and ask all the questions you have without waiting on a response. It's likely that you'll know right away whether or not an SEO agency is interested in your success or their own success — just from a simple phone call. When your website is designed with search engine optimization in mind, it will experience increased website traffic, a higher number of conversions, and a significant ROI. 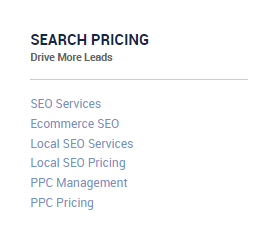 As one of the best search engine optimization service companies in North America, we can give you real results—and change your business for the better. Visit our SEO packages page for additional information on our SEO plans and services. Ready to work with one of the best SEO companies? Call 888.449.3239 or contact an expert online to start boosting traffic to your website.